Pompeii is probably the most well-known Roman archaeological site in the world. As you know, this ancient town, not very far from Naples,was suddenly buried by the 79 AD eruption of Mt Vesuvius. So it was therefore kept, frozen in time, for about two thousand years. The excavations of this amazing town started only in 1748. For these particular conditions the wall structures, the frescoes, the statues, the everyday objects have been preserved in an extraordinary way, thanks also to the lack of oxygen. Therefore the visit of this incredible place fascinates and captivates visitors, who can walk along the streets of that era like the ancient Pompeians used to do two thousand years ago. In addition, the large size of the city (150 acres of surface) disperse the visitors and it is rare that you feel the sensation of being in a "crowded" place. But in the past the magic atmosphere of this archaeological site could not be enjoyed by wheelchair visitors, for whom the ancient streets with the cobble stones represented an insurmountable obstacle. Fortunately a large project funded by the European Community, in December 2016, inaugurated a 3-kilometer route for disabled visitors, from the entrance of “Piazza Anfiteatro” to “Porta Marina”. 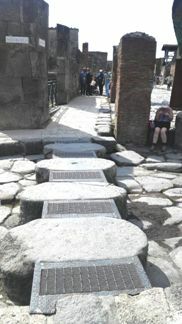 This has simplified and made it possible for visitors with mobility difficulties to explore numerous monuments in the ruins of Pompeii such as public baths, houses, shops, etc., through the platforms and sidewalks modified expressly for this need. Why an archaeologist on this tour? Since the construction of the path for disabled people in Pompeii, numerous travel agencies and Tour Operators have started to arrange tours with “ordinary” guides in the famous archaeological site. But for those of you who feel a particular interest in history and archeology, an archaeologist instead of a tour guide is certainly the best solution. Today modern archeology is strongly multidisciplinary and only a subject specialist (in this case an archaeologist) can help you appreciate this splendid "journey into the past". An archaeologist who carries out archaeological excavations, who continually compares himself with his colleagues of paleobotanics, of geology, volcanology, chemistry etc. can certainly be the best possible guide for your private tour to Pompeii. This private guided tour is focused on flexibility, personalisation and quality. You can decide any time you prefer to start your private tour. The tour begins from the Amphitheater of Pompeii where the itinerary for disabled starts. In addition this private guided tour for disabled with an archaeologist lasts 2 hours but it is possible to arrange with us private tours (always with your personal archaeologist) that last even 3 hours. THIS IS A PRIVATE DAY VISIT WITH A PRICE NOT BASED ON THE NUMBER OF PEOPLE TRAVELLING IN YOUR PARTY! THIS TWO-HOUR TOUR IN POMPEII RUINS WITH A REAL ARCHAEOLOGIST COSTS EUROS 200. THE ENTRANCE FEE IS NOT INCLUDED. THIS VISIT WILL OPERATE RAIN OR SHINE, SO BE PREPARED FOR ALL WEATHER CONDITIONS.